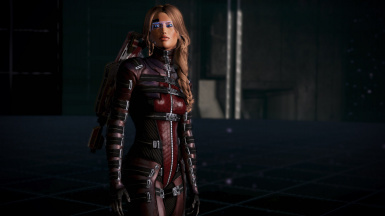 This mod adds the asari adept armour from multiplayer to Shepard's armour locker. 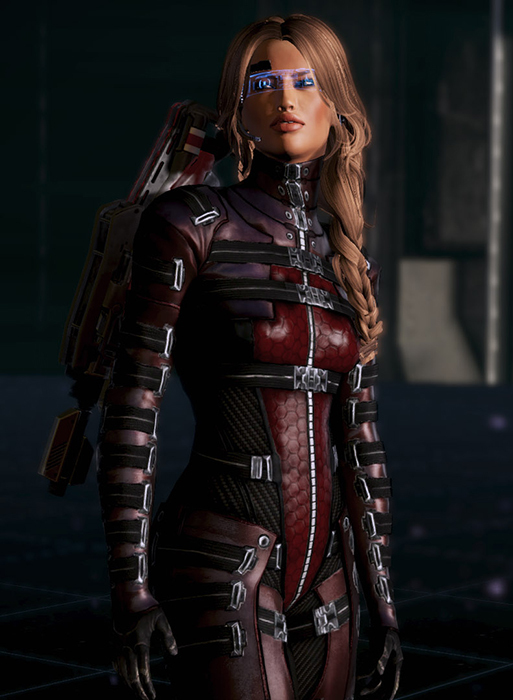 I was inspired by Grflbabl who made the excellent Customizable EDI-Shep armor mod to make my own customizable armour mod. 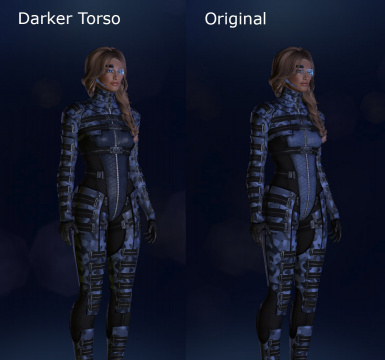 Luckily, the MP asari adept armour already had the necessary tint and stripe textures to make this possible. It just required a bit of shuffling the RGB channels around and that was it. The mesh was provided by ELE08 who ripped the head off the MP mesh and widened the neck. The HR textures were made by Smartek. Both graciously agreed to let me use their work in this mod. IMPORTANT! This mesh creates clipping at the neck. 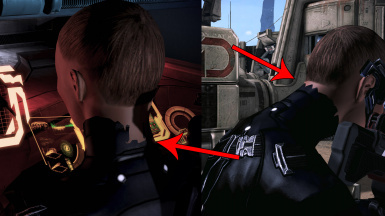 The problem can be minor or very bad depending on the size of your FemShep's neck and is completely covered if you use a long hair mod or partially covered if you use a hairstyle that comes below the chin. PLEASE look at the provided images. If this is going to be an issue for you, pass on this mod. I don't know how to fix it or if there is a fix so I'm sorry about that. UPDATE: ElysiumFIc made this into a DLC mod for me and it is included in her truly cool FemShep's Armory DLC Armor Mod. It includes many new armours that won't clog up your closet if you don't want them to and keeping all the mods in one DLC prevents more conflicts. If you REALLY just want this mod however, I've uploaded it here as a standalone. There are two texture options: ORIGINAL and DARKER TORSO. The torso section of the armour is coloured by the pattern colour in your armour locker. Because these colours are quite bright, I darkened that area of the texture. I think it looks better when you are using the camo pattern (please see images for comparison). Both options are included in the DLC version of the mod and both textures are in the manual version for you to choose from. I have included a READ_ME with the mod and you can also view it by clicking the tab at the top of this page. If you have experience with ME3 Explorer and the Coalesced Utility, it will be nothing new but it may be a little challenging for first-time modders.